Laclede Alloy Grade 80 & 100 chain and attachments are produced to exceed the rigorous requirements of overhead lifting. Lacled Alloy chain and attachments offer a design strength and elongation surpassing the National Association of Chain Manufacturers (NACM) specifications, as shown in the following charts. Great care has been exercised in selecting the chemistry for the forged fittings and wire used to manufacture our attachments and chain. In addition we employ induction heat treating to our chain to maximize its strength and increase the elongation characteristics. All Laclede Alloy chain andattachments exceed the stringent specifications as published in ASTM, NACM, ANSI B30.9 and OSHA specifications.The alloy chain is manufactured on sophisticated,state-of-the-art equipment. The chain is inspected and tested throughout the manufacturing process to ensure quality and performance. The attachments are also individually proof tested and certified. 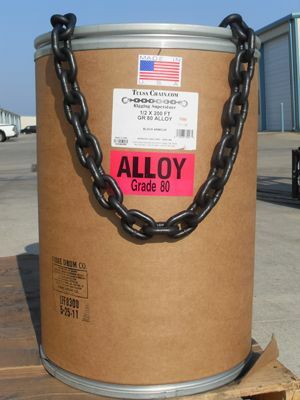 To assure traceability, all chain is assigned aunique number (trace code) representing a lot of chain, its heat number, chemistry and physicals allowing us to track the chain back to the steel used to manufacture the chain. All of our Laclede Grade 80 Chain is Made in the USA. To help identify the grade and manufacturer all of our Grade 80 Chain is embossed with”L8”. The L is the chain manufacturer Laclede. The 8 identifies this as a Grade 80 Chain. On our larger size grade 80 chain (3/4” +) it will be embossed with P8 or P80. The manufacturer is Peerless Chain. This chain is also 100% made in the USA. Grade 80 chain is typically finished with a black armour coating. This is a tough durable painted finish. Other finishes available are Electro Galvanized, Powder Coated, Hot Dipped Galvanized (with reduction of WLL) and Silver Shield. You will also find a trace code embossed on the chain. This trace code provides Information about the manufacturing history of the chain as well as the origin of the steel. The code is a combination of letters and/or numbers located on Grade 100, Grade 80, and Grade 70 chain. These grades are all heat treated. (A process that involves heating chain to extreme temperatures to harden the material and improve the metallurgical and tensile properties of the chain). Laclede and Peerless Grade 80 chain is 100% American made produced from the highest quality domestic alloy steel. The chain is tested throughout the manufacturing process. 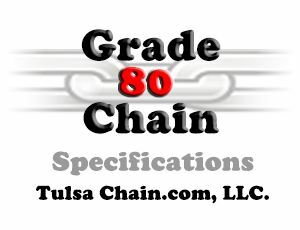 All of our Grade 80 chain is Proof Tested to twice the working load limit. The minimum break strength is four times the working load limit. Our USA Made Grade 80 Alloy Chain meets or exceeds all existing OSHA, Government, NACM and ASTM specification requirements. All of our Grade 80 Chain is 100 percent Proof Tested. Certs available free of charge.